After the success of the BMW X5, the German manufacturer decided a smaller, more reasonably priced crossover SUV would bridge the lucrative gap between the SUV, er, SAV (Sports Activity Vehicle), and 3-Series sedan. 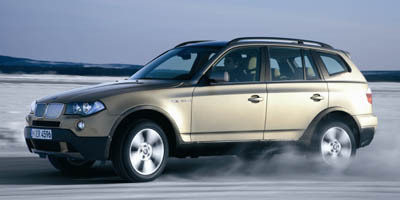 Thus, the BMW X3 was born in 2003. Unfortunately issues arose, as they tend to do in first-generation vehicles, and owners were looking for a better transmission, a smoother ride, more power, an upgraded interior and lower price tag. For the current second-generation, BMW has delivered almost everything asked for. The 2008 X3 is a carryover from the 2007 model year that saw a quicker six-speed transmission, 35 more horsepower to reach 260 overall and a more polished interior. We have yet to get a completely smooth ride, our rears felt the full brunt of bad roads, and that starting price hovers above all the X3’s direct competitors. Still, you can’t help but feel moderately impressed that those designers and engineers from Deutschland listened to us, even if they only felt we were 50 percent right. A luxe interior gives you all the comforts expected from a BMW. The X3 is based on the 3-Series platform, giving the crossover an almost equally sporty ride. The purchase includes four-year or 50,000-mile free maintenance as well as four years worth of roadside assistance. Exterior design won’t be for everyone’s tastes, and the price tag climbs higher than many SUVs of the same size. A standard auxiliary input jack is located in the back of the center console, initiating contortionist movements in order to reach it from the driver’s seat. This BMW continues the lineage of impeccably handling vehicles. The steering radius is tight and there isn’t an ounce of play in the wheel. Acceleration may not pack a turbo-fueled punch like the Acura RDX, but let’s just say hills won’t be a problem for this German machine that gets a 0-60 mph time of 6.9 seconds. Its torque delivers much earlier than the previous model’s, peaking at 2,750 rpm instead of 3,500. A new sixth gear results in better drivability and shifts happen much more quickly. With kids or groceries usually settled in the back, the stiff suspension doesn’t do the car any favors around town. It’s great at managing the corners though, but we wonder if it’s worth the trade-off. The cabin is comfortable and features seats that absorb some of the road’s unpleasantries but, in the rear, three people across makes for a tight fit. We love that the X3 has an available manual transmission, an option that many SUVs go without. But overall, the drive is more clinical than anything else. We’re missing the passion, the fire! Making things easy for buyers, the X3 has only one engine type: a 3.0-liter, inline six-cylinder that delivers 260 horsepower and 225 lb-ft of torque. There is an option of either a six-speed manual or automatic transmission. The SUV powers all four wheels with its xDrive, a system that sends power to the wheels needing it the most once it senses wheel slip. An all-wheel drive SUV can always use a cold weather package with heated front and rear seats, ski bag and retractable headlight washers. The Sport package adds accessories for the wannabe racers like 19-inch alloy wheels with performance tires, sport seats and a sport suspension. A navigation system with voice guidance is also available, but it means you’ll have to put up with BMW’s iDrive system – a confusing cluster of deep menus and unintuitive functions that don’t seem to simplify no matter how much time you spend with it. Aren’t these things supposed to make your drive easier? As much fun as it is to ride the brake while meandering down hills (we jest), Hill Descent Control works to avoid the loss of control in those circumstances. Press a button and HDC will activate the brakes for you on steep grades to maintain an adjustable speed of 3-6 mph. Dynamic stability control and dynamic traction control couple with the all-wheel drive to improve the agility of the X3. The stability control lets you push it further than you previously could and only corrects at the last second, while traction control does a fine job of placing power where you need it. The X3 returns 16 mpg city and 23 mpg highway with its manual and 17 city, 24 highway with the automatic, exactly matching the more powerful Infiniti EX’s fuel economy. It also takes the pricier premium unleaded gas, hurting you every time you fill up. Nevertheless, this SUV receives an earth-friendly ULEV-II emissions rating. The refined cabin features 60/40 split rear folding seats, standard leather and a tilting, telescoping steering wheel. As we’ve mentioned, full capacity can feel tight but the maximum cargo space measures out at 71 cubic feet with the rear seats down. The instrument panel is good-looking if a little boring and clinical. The X3 looks like a 3-series in the middle of a particularly awkward growth spurt – the front end is still car-like with a blunt, grille-adorned nose and overall it’s roughly the same length, but the body has been widened by over a foot and it’s taller by about 10 inches. An optional panoramic sunroof really opens the interior up and gives people in the backseat a dose of Vitamin D.
With the reputable name comes a slightly exorbitant cost. The X3 starts at $38,600 and packages can rocket the price tag closer to $50,000. Undercutting it are the Infiniti EX35 at $35,450, Acura RDX at $33,695, the $36,150 Land Rover LR2 and the $36,775 Volvo XC70. BMW’s tagline “The Ultimate Driving Machineâ€ certainly still applies to the X3. In dynamic driving situations, it’s the small SUV you would want. However, is it the ultimate car for driving to work, picking up the kids and running errands? Not really. Its high cost, tight interior and rough ride during the times you use a car the most left us wanting more out of this five-seater. If you want your SUV to perform like a driving machine though, this is the Bimmer for you.